TransDevelopment Group has reached substantial completion on a porous pavement finished vehicle storage lot adjacent to Terminal 6 at the Port of Portland. At nearly 19 acres, this site represents one of the largest porous pavement installations to date. The project, a public private partnership between Auto Warehousing Co. and the Port of Portland, was partially funded through a ConnectOregon VI Grant. The new site will accommodate the growing vehicle exports from Terminal 6 and reduce traffic and short-term vehicle movements on nearby roadways. Just five months after breaking ground on the Louisville Intermodal Terminal, TransDevelopment achieved substantial completion of the new 25-acre facility. The terminal was built under a demanding timeline that required operations to start on New Year’s Day to meet CSX Intermodal’s customer commitments. The facility was developed on an existing industrial parcel, which had one a mile of mainline frontage. The terminal has two loading tracks, which are served by modern reach-stackers capable of unloading containers off of both tracks. To accommodate the lift equipment and container stacks, a 21-inch thick section of roller-compacted concrete was installed throughout the operating area. Existing on-site buildings were rehabilitated to serve as the administration and maintenance buildings, and state-of-the-art site lighting and IT equipment was installed. TransDevelopment served as the turnkey Development Manager for the project, with responsibility for the planning, design, site-civil work, paving, buildings, electrical, and track improvements for the $12 million facility. TransDevelopment recently completed a new, $2.2 million turnkey expansion to the largest Atlanta-area terminal served by CSX Intermodal. The expansion was designed to enable Rubber-Tire Gantry (RTG) crane service to the final two loading tracks. Six RTG-capable tracks are now in service at Fairburn. The project established a 4,800-foot long craneway, constructed with roller-compacted concrete in two zones. The project also included earthwork and drainage improvements to accommodate the craneway, as well as relocation of six high-mast light towers. The crane service is expected to improve the efficiency of the loading tracks, which were previously served with side-loaders. 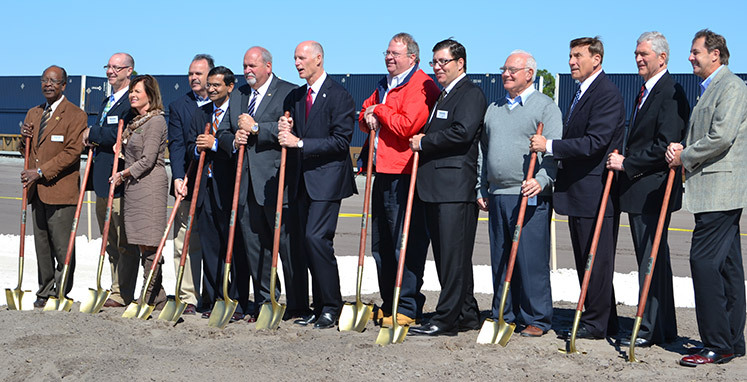 Following the groundbreaking in July, the project was completed over the course of four months. Terminal operations were unaffected throughout the duration of the work. The Port of Richmond and Auto Warehousing Co. have formally opened the new 100-acre automotive distribution facility at the historic Point Potrero Marine Terminal. American Honda has begun distributing vehicles through the facility. Members of the Richmond City Council, the Port of Richmond, Auto Warehousing and the BNSF Railway held a grand opening Sept. 14th to commemorate the new terminal and Honda’s return to Richmond. TransDevelopment Group designed and built the $40-million project under contract with terminal operator Auto Warehousing. TransDevelopment also managed project planning, environmental permitting and development coordination with the BNSF and neighboring industrial companies. The Port of Richmond California has kicked off the construction phase of $40-million in new port and rail infrastructure work at the historic Point Potrero Marine Terminal. The turnkey project will greatly enhance the port’s rail operations, allow American Honda Motor Co. to import vehicles for local dealers, and create a hub for outbound rail shipments. In 2009, Honda finalized an agreement with Auto Warehousing Co. (AWC) and the Port of Richmond to import more than 150,000 vehicles annually from foreign assembly plants to the San Francisco Bay Area. For three years, TransDevelopment has worked closely with AWC, the Port of Richmond, American Honda, and the BNSF Railway to bring the project to reality. The Port of Richmond has broken ground to kick off a $40-million rail infrastructure development that will allow the port to handle more than 145,000 imported American Honda vehicles per year. Earlier this year, American Honda announced that it would shift some of its imported vehicle volume to Richmond from the Port of San Diego. The construction project will dramatically increase BNSF Railroad service to the port. The existing rail line serving industrial tenants along the port entrance roadway will be upgraded and a second, dedicated, rail line will be added exclusively to serve the Honda account and other automotive tenants. A seven-track railcar loading and unloading facility will be built at the Point Potrero Marine Terminal. Later this year, when the first finished vehicles roll off the assembly line at Kia Motors Corp.’s newest manufacturing plant in West Point, Georgia, they will flow directly through a series of efficient processing facilities that were master planned by TransDevelopment Group. Then, the next-generation Kia Sorento SUVs will be loaded onto rail cars and travel over a new network of trackwork developed by TransDevelopment on Kia’s property where they will be privately switched to the CSX Transportation mainline and shipped to dealers across the United States and Canada. The $50-million Kia vehicle processing center and rail terminal – which included State of Georgia grant funding – is the third automotive assembly plant project that TransDevelopment has developed in the Southeast since 2003. TransDevelopment Mexico is providing a series of master planning and consulting services to the Guanajuato State Government to help design a large rail bypass project in Celaya, in central Mexico. The rail bypass initiative was officially announced by Mexican President Felipe Calderon February 24 at a ceremony in Celaya. The president said the four billion peso rail by-pass project will take several years to complete, but there are already 600 million pesos earmarked to start construction this year. China’s auto industry, ports and logistics professionals will be well-served to study the experience of their counterparts on the West Coast of North America, as strategies emerge for the global export of finished vehicles. That was a key message Bill Robbins, principal and co-founder of TransDevelopment, delivered in May during the Autologistics Asia 2005 conference held in Shanghai. Despite different approaches to building and distributing vehicles, European and North American automotive manufacturers can learn from each other to create more efficient operations and supply chains. That was the message John MacGregor, TransDevelopment’s president, delivered to nearly 200 attendees of the annual Autologistics Europe conference held in Montreaux, Switzerland. TransDevelopment paved nearly 40 acres of yard areas for vehicle storage, constructed four site buildings, and developed extensive track work and ancillary facilities. Once the design work was finalized, the Eurohub took nine months to complete. The Corby Eurohub has several design features commonly found at North American terminals, including a truck-away loading roadway and site security systems. TransDevelopment collaborated on the Corby project with several UK-based engineering and construction partners.